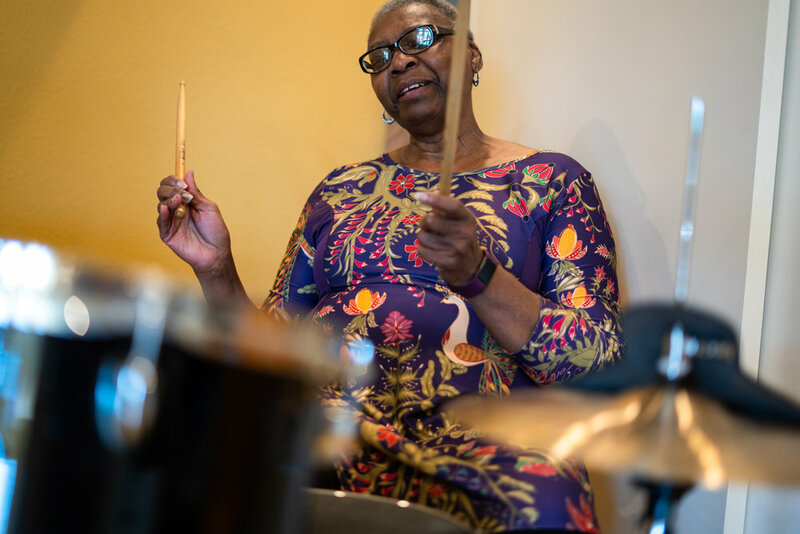 Gwen Davis plays the drums during her therapy session to work on pattern switching. Music therapy can involve a range of activities, from actual creation of music or beats to rhythmic movement to music playing in the background. Davis works on a strength exercise with resistance bands. Davis practices an egg toss exercise with two therapists. Hand-eye coordination exercises are routine in her therapy sessions. 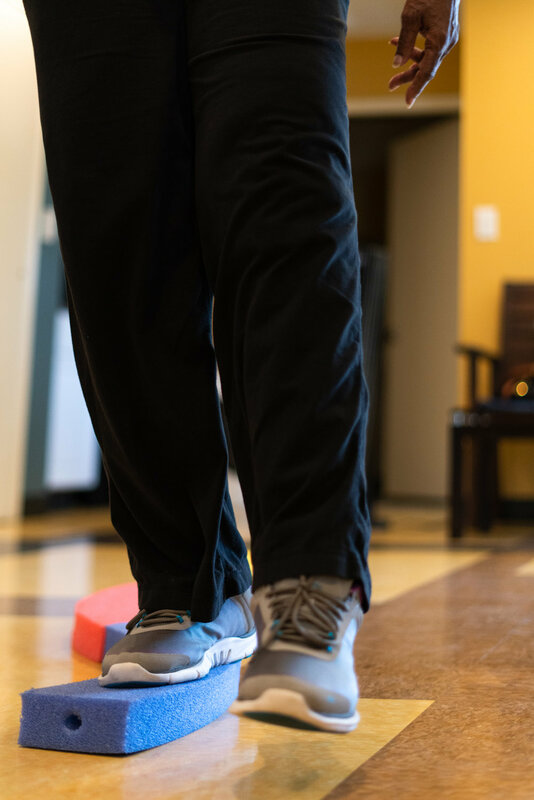 Davis works on a balance exercise as part of a larger obstacle course set up by her therapist. Davis works on a balance exercise with her music therapist Emily Morris. Davis says she likes to be challenged in these therapy sessions and Morris pushes her while making their sessions fun. Davis sits on the porch as she watches her daughter Felicia lead her adopted son Matthew out of the storage room after a horse therapy session. Matthew is visually impaired, with other special needs, and Gwen feels that an alternative approach to therapy has helped him immensely. Gwen takes Matthew’s hand to go for a dance at the annual prom celebration at Rosedale School in Austin, Texas, a school he attends that provides tailored programs for students with special education needs. 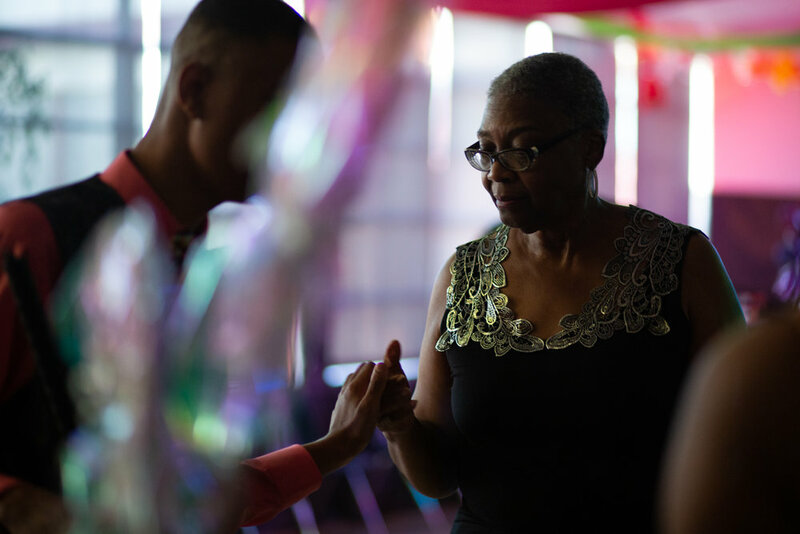 Matthew enjoys a dance at his school’s prom celebration on May 19, 2018. This year’s theme was “Candyland”. Gwen waits outside of the dining area at her son Matthew’s prom held at Rosedale School on May 19, 2018.